Michael Kessler is known throughout the Treasure Coast as the Go-To-Guy for DUI. Mr. Kessler is a 1985 graduate of the University of North Carolina School of Law. Mr. Kessler is a Board Certified Criminal Trial Specialist. He was identified as a “Super Lawyer” by Law and Politics Magazine in 2008, 2009, 2010, 2011 and 2012, the first Treasure Coast lawyer to be so honored five consecutive years. Mr. Kessler has been awarded the highest possible rating by both Martindale-Hubbell and Avvo, the leading consumer agencies that evaluate lawyers. 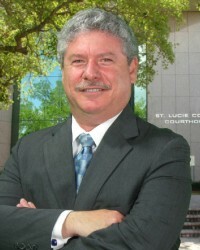 An active member of the National College for DUI Defense, Michael Kessler is certified to administer Standardized Field Sobriety Tests approved for use by the National Highway Traffic Safety Administration (NHTSA), and is also certified to administer breath alcohol tests using the Intoxilyzer 5000 and 8000 machines. Mr. Kessler owns his own Intoxilyzer 5000 and 8000 breath-alcohol guessing contraptions. Mr. Kessler founded and manages The Kessler Law Firm, whose offices are in Fort Pierce and Key West. Mr. Kessler has taught at DUI Defense seminars in Atlanta, Columbus, Ohio, Los Angeles, New Orleans, Fort Pierce, Stuart, West Palm Beach, Key West and Orlando, as well as aboard a Carribean cruise ship. He is the co-author of The DUI BOOK: Florida Edition, along with prominent Atlanta DUI lawyer William C. “Bubba” Head. His clients have included American League Most Valuable Player Miguel Cabrera, St. Lucie County Judge Kathryn Nelson and Molly Hatchett lead guitarist David Hlubek.